Vid Disney-owned Jobs-derived animation outfit Pixar has open-sourced some of its production software. Pixar started life as a software company and still operates a division selling its RenderMan wares, which have been pressed into service making innumerable films beyond the walls of Pixar itself. A simple translation of the above is that the apps help create very detailed surfaces on animated objects. 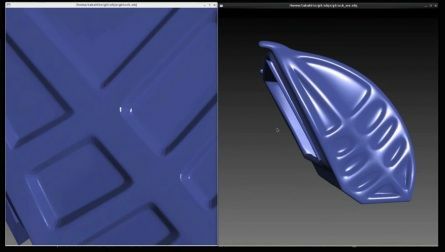 The image below, for example, shows an object untouched by Open SubDiv at right, and a more detailed and precise version processed by the software at left. Which means this release is not something for everyone. But Pixar has released the software under a licence permitting any commercial or non-commercial use. Pixar's Manuel Kraemer told the Siggrpah conference last week that the code is used at Pixar and that a full release is due late in 2012. Kraemer also said the studio has decided to freely licence some of its patents to make it possible to use Open SubDiv without attendant angst about future legal worries. Kraemer explains Open SubDiv and shows off some of the ways Pixar has put it to use, including in its recent Brave, in the video below.